This “never-really-trendy” haircut invented almost 30 years ago, in the 80s/90s, was adopted by the rock world as well as by some “hipsters” of the moment. It however, didn’t take long for people to ban it. Also categorized as a capillary penalty at this period, rare photos of people wearing it are valuable and were for long better hidden in the grandmother chest drawer to avoid mockery. But what exactly is the mullet? Let’s do a recap for you Z generation. You might not had had the pleasure of seeing little boys walking on the street with this haircut during your childhood. The mullet it’s a hairstyle that includes long hair on the neck and short hair on the temples. With time and retreat of the capillary lessons, it has been classified as dangerous as well as worst haircut of the hairdressing history. But what was for long considerate, as a fashion faux pas, seems to have a second youth. 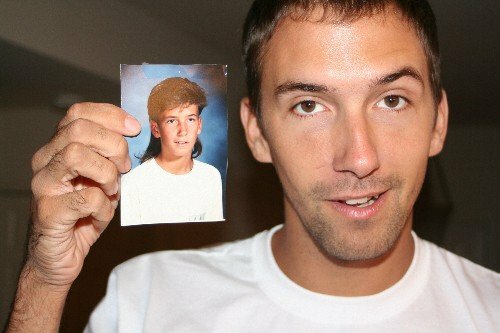 We just need to see the tone of photos shared with the #mullet on Instagram to understand the rising phenomenon. And nothing is better than social networks to influence and spread the refreached haircut. Celebrities as well as random citizens proudly publish selfies with this haircut. The mullet strikes every continent, every gender, every style…. And for now on, seduce even women. Indeed, they have embraced the “awkward-chic” mullet hair cut describes Marsa Meltzer in the New York Times. The photo of an original and modern “jellyfish” mullet version from the London based hairstylist John Vial, went viral on people’s favourite social network for photos: Instagram. ... or this young man who challenges Internet users to do better than him. Even the fashion world appropriates itself. All over the world, as in Asia and in Europe, brands use the haircut as a new code of fashion. Lauren Valenti, late September, has dedicated for Vogue an article on the tendency. In total: 38 looks for the Sprint 2018 show designed by the American Virgil Abloh with a few to bring up to date the “never-really-trendy” mullet haircut on the models Fernanda Oliveira, Danielle Lashley, and Moira Berntz. It has become such a phenomenon that the small town of Kurri Kurri, not far from Sydney in Australia has organised for the first time a Mullet Festival. The reason is simple. This haircut is probably the most loved and loathed hairstyle in the country. Present to meet their comparable, people wearing mullet get the opportunity to be elected “best mullet of them all”, judged on the haircut naturally as well as their overall presentation and stage presence. After all, ‘the mullet is not a haircut, it’s a lifestyle!‘ “The mullet will live forever, and Kurri Kurri is the home of the mullet!” as reported in The Guardian. Is the mullet gonna last long in fashion this time? Only time will tell..